Cracked heels are a relatively common, but often painful problem which occurs when the skin on the underside of your feet becomes overly dry. Some heels get thick and callused while others crack. This lack of moisture can lead to cracks and fissures on the heels causing soreness when walking or standing, bleeding and possibly even serious infection. The skin on the feet is naturally drier than the skin elsewhere on your body but there are a number of contributing factors that can lead to a serious lack of moisture, which can cause cracked heels. When it comes to cracked heels, prevention is certainly better than cure. Try to stay hydrated and moisturized and take as much care as possible by observing the factors listed below. Cracked heels can vary in severity from mild to very severe; while cracked heels are usually fairly harmless, severe cases might cause complications such as difficulty in walking or even standing which your job might require you to do. Other complications from more serious cases include itchiness, burning, bleeding and infection when the fissures in your heels get exposed to dangerous bacteria. If you are worried about your symptoms, a podiatrist is generally better qualified to treat you than a dermatologist because in addition to being foot doctors, they have training in dermatology. If your case of cracked heels is not severe enough to make a doctor’s appointment, there are a number of very effective and convenient ways that you can treat and improve your symptoms at home and with any luck getting you back on your feet in no time at all. Good quality oils can be used to treat your dry feet and cracked heels very easily and we hope, effectively. Simply massage a spoonful or so of olive or coconut oil into the heels before you go to bed paying special attention to the cracked areas. Put on a pair of socks or heel socks to make sure the moisture is retained in your feet. You should notice that your heels are feeling softer and smoother the following morning. Repeat the process each evening before bedtime for as long as necessary. You could also use avocado oil by following the same procedure. The health applications of essential oils are almost too numerous to count and their application in skin and foot care is no exception. Several essential oils are well-known to be effective in treating dry skin in general and cracked feet in particular. 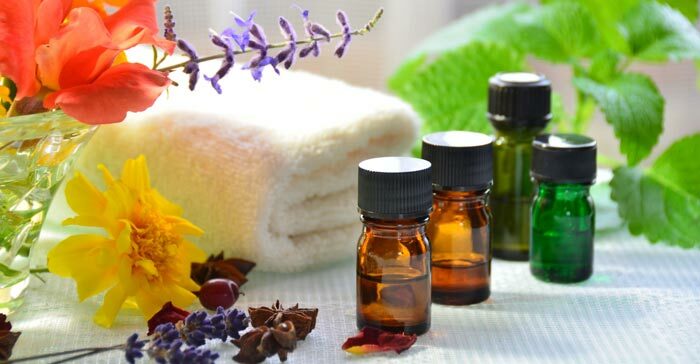 While there are a number of essential oils that you could try; lavender, peppermint and eucalyptus essential oils are the most highly recommended. There are several ways that you could use essential oils to treat those cracked heels. Make a soothing massage oil by diluting the essential oil of your choice with good quality carrier oil such as coconut or olive oil. Gently massage the mixture into your cracked heels before bedtime then cover your feet with a pair of socks. Repeat the procedure every night until your symptoms have cleared up. You will need a cup of dry oatmeal, a cup of cornmeal, a quarter cup of coarse salt and a teaspoon of peppermint essential oil. Mix your ingredients thoroughly then gently massage the scrub mixture into your heels to remove any dead or dry skin. Add 4 or 5 drops of your essential oil to a warm bath to help moisturize your heels as well as giving the rest of your skin a relaxing treat. Make sure that your hot water has finished running before adding the oil to avoid evaporation. Make a foot soak with hot water and essential oil. Lemon juice is mildly acidic and will help you to rid your heels of any dried skin after it has dissolved. Simply prepare a warm footbath by adding around half a cup of lemon juice and allow your feet to soak for 10 minutes or so. After you have finished soaking your feet, use a soft brush, a sponge or a loofah to scrub your feet down. Make sure that your feet are not in any pain before you try this method. Epsom salts are so useful that I always make sure that we have some stored away in case they are needed and they certainly come in handy if you are trying to treat your cracked heels. Fill a suitable foot tub with warm water and mix in half a cup of your Epsom salt. Soak your sore feet in the solution for at least 10 minutes then scrub your feet with a loofah or a soft brush. After drying your feet, apply petroleum jelly, coconut oil or a foot cream to retain the moisture. Putting on a pair of socks will further help your heels to keep hold the moisture. Add the juice of a whole lemon to a teaspoon of petroleum jelly or Vaseline. After washing and drying your feet, apply the mixture to your heels paying close attention to the cracked areas. Try to do this every evening before you go to bed and again make sure that you put on a pair of cotton socks to retain the moisture. This one sounds odd to me but it honey has antibacterial properties and it is apparently a well-established and effective home remedy for cracked heels. Prepare your foot bath by stirring a cup of organic honey into a tub or bucket full of warm water. Soak your feet in the water for a minimum of 10 minutes then gently scrub your feet with a sponge or a loofah. You can repeat the process daily as often as you feel is necessary. This is another cheap and convenient home remedy to try on your cracked heels owing to the way bananas work as an effective moisturizer for your skin. Make a smooth paste by mashing a whole ripe banana. After cleaning and drying your feet, apply the paste to your cracked heels. Raise your feet on something comfortable and allow the paste to absorb into your heels for around 15 minutes. Clean your feet and scrub gently when you have finished. You can repeat the process daily for as long as necessary. You can also combine the banana paste with 2 or 3 teaspoons of coconut oil which makes an effective moisturizing combination. Shea butter is full of healthy vitamins and other nutrients as well as essential fatty acids that can help to replenish and moisturize your skin. Before bedtime, massage the shea oil into your heels and then put on a pair of socks to ensure the moisture is retained. Repeat this procedure every night before bed until your symptoms have cleared. I hope that some of these simple and convenient natural home remedies help your feet to recover but remember that there are certain things you can do or avoid doing to prevent developing cracked heels in the first place.